US freestyle MX star Mike Metzger has been filmed landing an amazing 48ft backflip, and you can see the sensational video online. 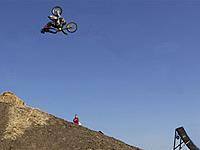 Carey Hart was the first to attempt the backflip and Caleb Wyatt managed to be the first to land one, but now ‘The Godfather’ Mike Metzger has managed to backflip a 48ft gap on his CR250 for a promotional piece for US TV network ESPN. If you want to see what a 48 ft backflip looks like, follow this link: http://expn.go.com/mtx/freeridemotox/s/020703_metzflip.html to watch the video. The significance of this jump isn’t that Metzger managed a successful backflip, it’s the fact he managed it three times in five attempts, showing the race is on for the first backflip in competition. With Wyatt, Hart, Metzger and racer/freestyler Travis Pastrana are in contention, and the X-Games, the Olympics of extreme sports taking place on Aug 15-19, it won’t be long before everyone goes backflipping crazy.